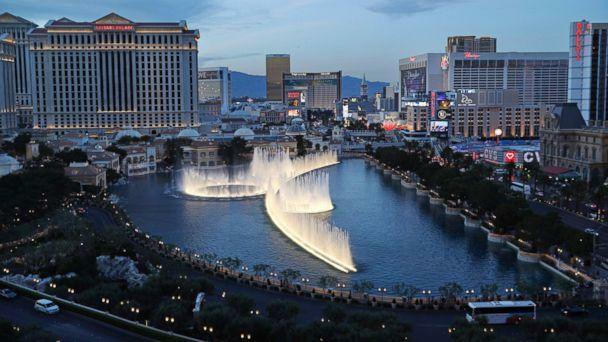 An attempted robbery at the Bellagio Hotel and Casino in Las Vegas ended in a gunfight between police and the suspect late Friday. An armed man walked into the casino and approached a popular poker cage, where he demanded money, before quickly fleeing out the north entrance, Las Vegas police said in an overnight press conference. The suspect attempted to carjack someone at the valet but was confronted immediately by four uniformed officers. The man turned and fired at least one shot in the direction of an officer who was struck in the chest, police said. Kevin McMahill, an undersheriff with the Las Vegas Police Department, told ABC News the officer was hit "square in the chest." "The bullet hit the cell phone in his pocket and then bounced off into his vest," McMahill said. "He was really lucky." He was treated and released, police said. A second officer returned fire, striking the suspect. The suspect was also struck in the chest. The man, who was not identified, died a few hours later, police said. The casino was filled with police officers Friday night because they responded to a report of a missing 12-year-old girl, officials briefed on the investigation told ABC News. McMahill said the girl had come to Vegas with her parents but was lured away from her family by an adult man. "He lured her on the internet," he said. Police traced the child to the Bellagio and were able to arrest the man in connection with the missing child. As officers were in the casino's surveillance room reviewing CCTV footage connected with the missing child, they're "watching the robbery live" on security cameras. Police immediately put the call on their radios about the robbery, leading at least two groups of officers to confront the suspect outside the hotel. There were two robberies at the Bellagio in 2017. In March 2017, three men in animal masks used sledgehammers to smash their way into a luxury jewelry store before at least one of those suspects was apprehended. In a robbery similar to Friday night, a man was able to make off with money from a poker cage at the Bellagio in November 2017. He was able to get away with an unspecified amount of cash. Almost a year later, that suspect had yet to be caught, according to CardPlayer, a casino gaming news site. Detectives now believe the suspect could be responsible for a similar casino-cage heist that occurred at the Bellagio about a year ago, McMahill said. In that robbery, the alleged robber was wearing bandages on his face and some cops took to calling him the "invisible man." The man appeared to be working alone, but investigators are still poring over surveillance footage and images from outside the hotel to see if there were any accomplices. The Bellagio, and its famous dancing fountains, play prominently as one of the casinos robbed in the film "Ocean's 11."